Good game. We barely eked that one out. I watched this game with my cousin who is a diehard Rams fan, so I wasn't around during the game. 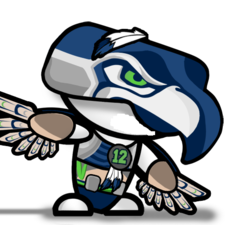 Really proud of the Seahawks for fighting and giving it their all vs an opponent who is definitely much more talented. The Rams also showed a lot because even though this was an ugly game for them at times offensively, they still were able to grind it out and come out with the victory. This is the type of game they would have lost last season.